ome truly great wine is now being made in the Languedoc. Most but by no means all of this is produced under a number of different appellations. For reasons of practicality and location a number of splendid new-wave wines, particularly red, are being produced as IGP. A number are IGP d’Oc but IGP de l’Hérault also features, including two of the greatest properties in the Languedoc, Mas de Daumas Gassac and Domaine de La Grange des Pères. To the west of the Costières de Nîmes (see Rhône Valley) is the giant spread of the Languedoc AC. This was formerly known as the Côteaux du Languedoc and the appellation umbrella also now includes appellation vineyards in the Roussillon as well. Vast and sprawling, it stretches from Nîmes in the east around the coastline south now to the Roussillon. In general though most wines which took the Côteaux du Languedoc classification will now be Languedoc. There are fourteen communes which are allowed to add their village names as crus and these include La Clape, Pézenas, Cabrières, Montpeyroux, Pic-Saint-Loup and Saint-Drézéry. At best there are some splendid wines, generally blends of Syrah, Grenache and Mourvèdre for the reds with whites from a host of varieties including Roussanne, Grenache Blanc and Clairette. Sadly, you are also likely to encounter a great many moderate to average bottles, so always try to buy from a good source. 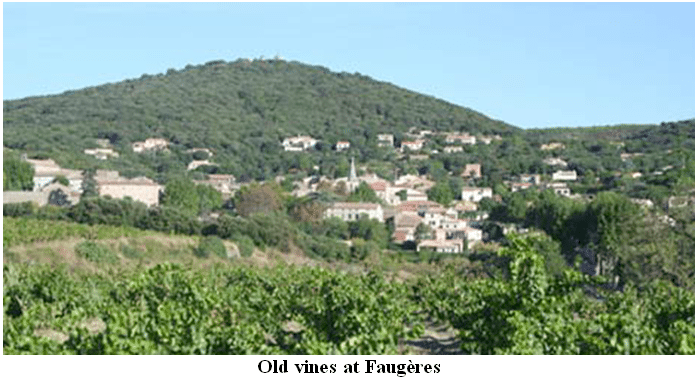 Just to the north of Béziers and to the west of the old Languedoc are the small appellations of Faugères and Saint-Chinian. Some very fine small properties are now producing great reds, the most important variety being Syrah (which performs superbly in the schistous soils of Faugères) although Grenache, Mourvèdre and old-vine Carignan all play an important role in the local viticulture. There are a number of Muscat-based vins doux naturels as well but few are comparable to their peers from Muscat de Rivesaltes in the Roussillon. They include Muscat de Frontignan, Muscat de Mireval and Muscat de Lunel. To the west of Béziers, just inland from the coast, crisp and economically priced whites are made at Picpoul de Pinet. South of Narbonne and stretching down to the hills of the Roussillon are a number of key appellations. Minervois, Corbières and Fitou had for a long time been regarded as little more than Midi workhorse wines, vinified by unambitious local co-ops or volume négociants. This has to a large extent changed for the better. The wines of Minervois have shown the most potential and within that appellation is the new cru sub-zone of La Livinière, the source of generally the densest and most substantial wines of the AC. Old-vine Carignan plays an important role here although plantings of the Rhône cépages améliorateurs continue apace with some vineyards now possessing some increasingly old Syrah, Grenache and Mourvèdre. Carbonic maceration is widely used for Carignan, particularly in Corbières. To the west of Minervois, the smaller new AC of Cabardès has real potential and the Bordeaux varieties Cabernet Sauvignon, Merlot and Cabernet Franc are important here. The biggest disappointment over recent decades has been the performance of Fitou, one of the first ACs established in the region. The co-op at Mont-Tauch has always been a solid source but other promising new producers are emerging.